Julian Barnard started Healing Herbs not only to make original method Bach flower remedies at full- strength stock concentrate but also to stimulate original research into the remedies and how they work. 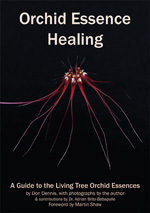 Healing Herbs continues to publish the unedited work of Dr Bach along with Julian Barnard's own original study of the relationship of plants to the human condition. Healing Herbs' Bach flower postcards are useful as a reference to the plant identities and can also play a role to help diagnosis. 'Bach Flower Remedies - the essence within' details the way that the flower remedies are used, and gives instructions for the way they are made. Each of the 38 remedies is examined in detail: why each plant was chosen, where the plants can be found, and to which emotional states they relate. Richly illustrated, this book is both a work of reference, and a practical guide for those who wish to help themselves with this natural, safe and effective form of healing. The authoritative text is the result of more than 30 years of work with Bach essences. A beautiful celebration of the herbs of the field placed here for our healing. This thoroughly revised edition includes all of Dr Bach’s published books, articles, papers and lectures about the Bach flower remedies together with his letters, notes and many detailed case histories. The discovery and development of the Bach Flower Remedies are clearly charted. Dr Bach’s earlier work is also given full attention, including his papers on vaccines, homoeopathy and the bowel nosodes. This book is required reading for anyone using or prescribing the Flower Remedies, for all those concerned with homoeopathy, and anyone curious about complementary medicine. Often said to be the only book necessary to understand the Bach flower remedies. A collector’s edition, as originally written by the man whose vision introduced flower essences to the world. Includes Bach’s account of the sun and boiling methods of preparation.